THE 5,000 year-old Gua Tambun Neolithic rock paintings will soon be history if conservation measures are not taken to preserve them from fading away. These paintings, comprising depictions of local fauna, anthropomorphs and abstract shapes of red, purple and orange, are vanishing due to the battering weather through out the years and lack of preservation measures to conserve them. Perak Heritage Society vice-president Law Siak Hong said although old reports described the site to be hosting about 50 paintings, recent research by other experts estimated over 500 existed there, making it one of the largest rock art sites in Malaysia, if not the largest. 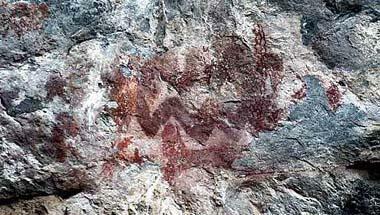 An important find: A painting which resembles serpents on the rock shelter at Gua Tambun. The wall paintings were discovered by Lt R.L. Rawlings of the 2nd Battalion, 6th QEO Gurkha Rifles high on an abrupt limestone cliff at Gunong Panjang in 1959. Some of the paintings, depicting animals such as deer, turtle, wild boar and tapir, are easily identified. There is also a drawing that looks like a dugong but some claim that it could be a giant catfish. Many of the other paintings are indistinct and some imagination is needed to interprete them. An initial survey of the site in 1959 also unearthed re-stained stone tolls attributed to the Hoabinhian period. Law said the name Gua Tambun was a misnomer because the site is a rock shelter rather than a cave measuring about 100m wide and 50m above the ground. Of interest: Prehistoric art at the rock shelter in Gua Tambun. Experts claim the figure at the top right is that of either a dugong or a giant catfish. Access to the site is through a 10-minute walk trail followed by a steep climb up a flight of stairs. 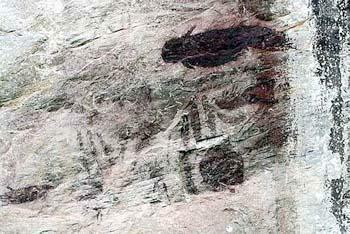 “The Tambun rock paintings are one of the most significant pre-historic sites in Malaysia. Its location in an urban centre provides easy access and it is also open to careless destruction through ignorance, inappropriate and irresponsible behaviour and vandalism. “Since its discovery in 1959, there has been no attempt to protect the site nor conserve the fading paintings,” said Law. He said conservation of rock paintings anywhere in the world was a formidable challenge. 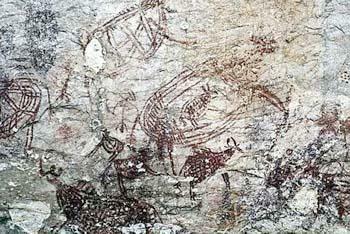 Rough sketches: A panel of paintings depicting animals found on the rock shelter at Gua Tambun. “There is not much one can do to stop the fading of the paintings. But as front line of conservation action, documenting the paintings through photography will at least leave us with a collection of historical images before they are completely lost to the elements,” he said. Law said it was a rare opportunity to be able to enjoy significant relics in their natural state. ”Be grateful and take caution. As the site is not protected by security, visitors must be self-responsible. “This archaeological site demands respectful behaviour on site,” he added.